Zeno In Your Living Room… | Zeno Agency Ltd. Through the wonders of modern technology, you can listen to some of our authors read and discuss their work, whilst relaxing in the comfort of your own home! John Meaney has just dropped us a line to let us know he’s added a page of downloadable audio to his author web site. Follow the link and you’ll be able to hear John don the disguise that is is alter-ego Thomas Blackthorn, reading the first chapter of soon-to-be-published novel POINT as well as that of EDGE, both Angry Robot releases. And another of our Angry Robot stars, Lavie Tidhar, is the guest on the latest podcast over at The Functional Nerds – head over there to hear Lavie discuss his novel THE BOOKMAN, forthcoming sequel CAMERA OBSCURA, and the third book in the series that he’s currently working on, as well as his life, his writing and all sorts of other stuff. 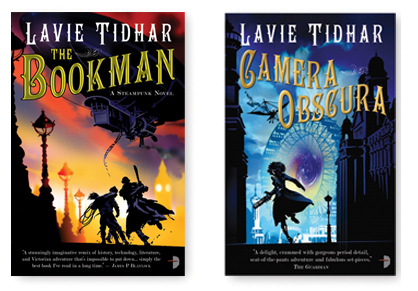 You can also hear Lavie discussing Steampunk with Jeff Vandermeer and Karin Lowachee over at Cheryl Morgan’s Salon Futura podcast.